The Avril Sweet Almond & Shea Butter Neutral Cream 200ml is particularly designed for sensitive skins. This cream is hypoallergenic, fragrance-free and enriched with organic Sweet Almond oil and Shea Butter providing a real and immediate sensation of comfort. Enriched with Shea Butter, organic Sweet Almond oil and Aloe Vera. Cosmetic product certified COSMOS ORGANIC by Ecocert Greenlife avalaible on http://COSMOS.ecocert.com. 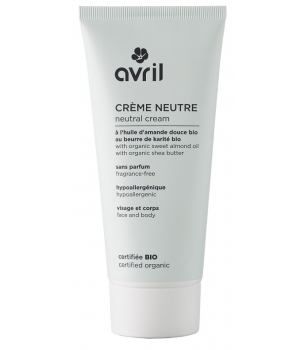 Apply the Avril Neutral Cream starting from the lower part of your body. Perform light circular massaging motion to help nourishing active ingredients penetrate insisting on dry areas such as your feet, knees, hands and elbows. This cream can also be applied on your face.